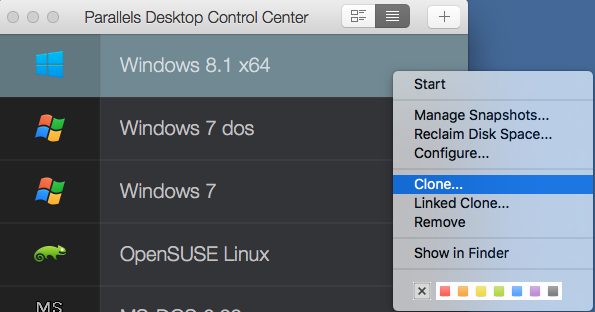 How to clone a virtual machine? I need an exact copy of my virtual machine. How can I create a complete clone of it? NOTE: The virtual machine shut be in shut down state. Specify the name and folder for the virtual machine clone. The default name suggested by the assistant is made by adding Copy of to the original virtual machine name. By default, Clone Virtual Machine Assistant places the cloned virtual machine into your Documents > Parallels folder, but you can specify a different folder. Click Save to start cloning the virtual machine. Once the cloning has been completed successfully, the new virtual machine is ready to use.